Baltimore / Washington DC Metro Area! from cost to the products capabilities. We offer same day delivery to Maryland, Virginia and DC! much safer than Calcium Chloride and Sodium Chloride (rock salt). Same day delivery to Maryland, Virginia and DC! available to melt ice and snow. Some contain CMA which help protect surfaces. period while adding traction at a lesser cost. Is melting ice quickly the only factor to base your decision on? Or is substantiality over a greater period of time important? * Is detection needed such as non-tracking dyes or colorants? * Are you applying to asphalt or concrete? Does the concrete have air entrainment or is it dyed? you know fancy names do not melt ice and snow! We have done "real world" testing on all of the products we offer. data sheet to really know what your getting. A good blend will allways state what's in the bag. Get something that contains at least 5% or more of hydroscopic products. Here are a few options we stock or carry to help you with your quest. Remember, we are just a phone call away! which is not available at low temperatures. it gives off heat thus melting the ice. popping as it does its job of melting ice. other ice melters would fail. heavily, an oily residue may appear. We offer calcium chloride in a spreadable round pellet form. Made in the USA not a product of China! alternative and melts ice fairly well in moderate to low temperatures. harmful to vegetation and pets. If cheap ice melt is what you are seeking, salt is your option. unusable solid block of salt. spread through a broadcast spreader. 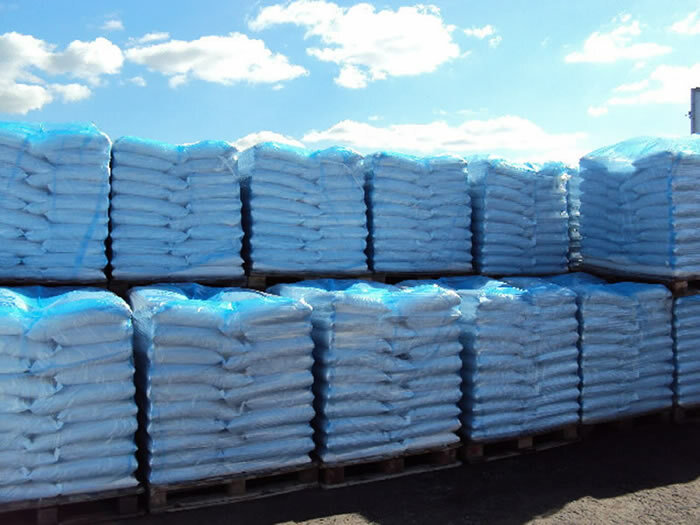 , We stockdeliver and carry bulk rock salt! Do not asume the product is appropriate or safe to use. main concern when snow and ice accumulates. roads from potentially dangerous ice. and ammonium sulfate are fertilizers that contain nitrogen. 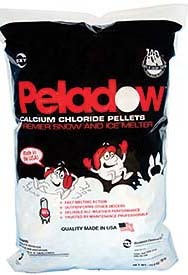 This product is illegal to sell or be used as ice melt within Maryland! damage concrete the worst of all products available. used as an ice melt on bridges, parking decks and airport runways. users, as it costs four to five times more than calcium chloride. will find it is in miniscule amounts, thus being in-effective. controlled environment, not a practical ice melting temperature. of salt out on the sidewalks. previously were the practical melting temperatures. contained within the product and know what you are buying. are too many variables in the amount of ice melter used. How much snow and ice must be removed? How many times per year will ice melter be applied? Where does the melted snow and ice go? of 1/2 cup to 1 cup per square yard. to build up in the soil, resulting permanent damage. Fertilizers often are assumed safe for turf because they are fertilizer. than the rates for feeding. Damage could occur is over applied. also will help lessen the problem. concrete containing rebar or around steel structures. have not always proven effective. placed in a solution of ice melter with corrosion inhibitor and water. not likely to reach the rebar. Don’t forget, stock up early so you are not without product. private sector as well as many Government agencies. Allow lead time if being delivered. most effective, safe and economical products to your application. Important: The information presented herein, while not guaranteed, was prepared by technical personnel and is true and accurate to the best of our knowledge. NO WARRANTY OF MERCHANTABILITY OR OF FITNESS FOR A PARTICULAR PURPOSE, OR WARRANTY OR GUARANTY OF ANY OTHER KIND, EXPRESS OR IMPLIED, IS MADE REGARDING PERFORMANCE, SAFETY, SUITABILITY, STABILITY OR OTHERWISE. This information is not intended to be all-inclusive as to the manner and conditions of use, handling, storage, disposal and other factors that may involve other or additional legal, environmental, safety or performance considerations, and N&S Rentals, Inc. assumes no liability whatsoever for the use of or reliance upon this information. While our technical personnel will be happy to respond to questions, safe handling and use of the product remains the sole responsibility of the customer. No suggestions for use are intended as, and nothing herein shall be construed as, a recommendation to infringe any existing patents or to violate any Federal, State, local or foreign laws. Using ice melter can be harmful to property and surrounding areas. Read the label and make your own determination. Information provided withing this page is simply the opinion of the writer and he/they shall not be liable for any damages that occur.